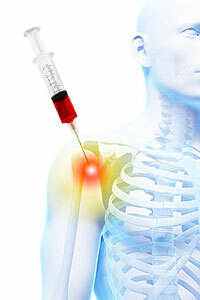 Arthritis injection therapies provide a safe and non-invasive alternative to surgery. PRP Injection therapy for lower back pain is a minimally invasive option to treat back pain. With a proper and prompt diagnosis, the treatment of the affected area will typically allow most patients to resume normal activities and return to work in a relatively short period of time. Platelet Rich Plasma (PRP) Injection is a treatment procedure utilized to provide an injection of your own platelets to promote the natural healing of damaged joints and soft tissue of the spine. This procedure is a recent breakthrough option for pain relief without surgery and medications. Patients with neck and back pain, and those with whiplash injuries have greatly benefited from the use of PRP. How specifically does PRP work? The injection of PRP or concentrated platelets releases growth factors, which generates an accelerated natural immune response, including mobilizing stem cells to the injured tissues. Specialized white blood cells – Macrophages enter, remove damaged cells, and prepare the tissue for healing to take place. Accelerated healing response and restoration of damaged tissue takes occurs when stem cells and other cells multiply resulting in reduction of pain, the regaining of strength, and return to normal joint function.